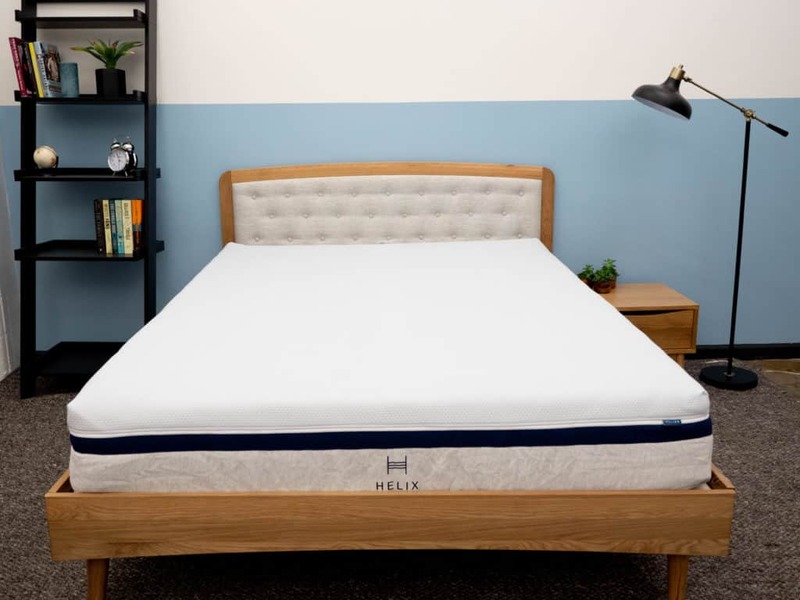 For this review I’ll be digging into the suite of new beds from online mattress company Helix, a popular brand known for its wide variety of mattresses. The latest product line includes six different models of various firmnesses and feels, but I’ll only be looking at two of them: the Moonlight and Midnight. Will these freshly launched beds live up to the hype of their predecessors or will they fall short of their custom-made comfort? I won’t know until I put them to the test, examining how they sleep and how they feel to determine whether or not one of them could be the mattress of your dreams. Continue reading below for my full review of the Helix mattresses. Don’t have time to read it all? Click here to skip to the bottom and check out my review summary. While both the Moonlight and Midnight are hybrid beds that fall under the Helix umbrella, they’re actually quite different. The former offers a plush feel intended to provide the sleeper with ample pressure relief. Conversely, the latter is billed as medium firm, with balanced support reportedly ideal for side sleepers. As I mentioned up top, the new Helix line features six different models that are broken down into three categories: Soft, Medium, and Firm. There are two mattresses at each level, one of which is built with a latex alternative and the other with memory foam. Below, I’ll detail their individual characteristics and then compare them side-by-side. As I mentioned up top, the Moonlight is one of two Plush beds in the new Helix collection alongside the Sunset. It features soft foam top layers overlaying a pocketed coil system, which makes for a gentle yet buoyant structure. 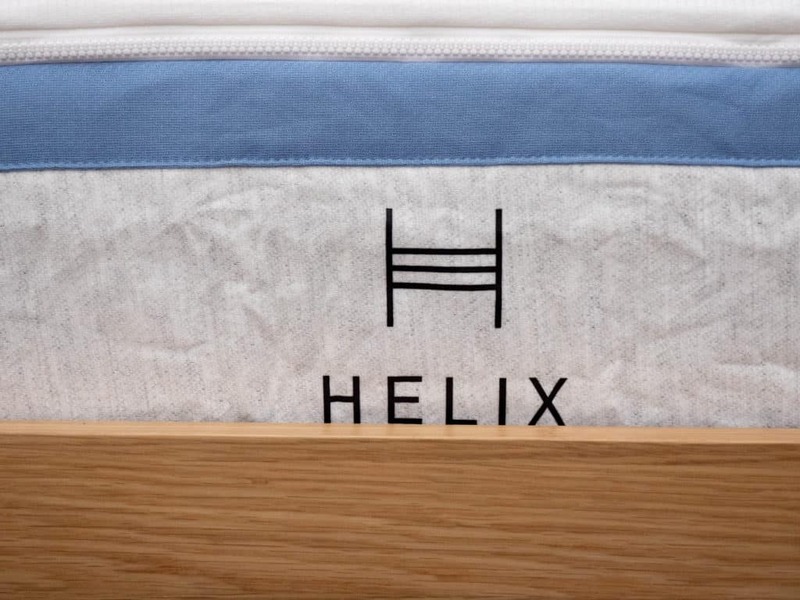 Cover – Initially, all Helix mattresses come with the same cover, made of 100% polyester. I found it to be stretchy and thin, allowing for some nice breathability. However, if you want something more amped up, you can opt to swap out the standard cover for the brand’s UltraCool one, which is composed of a phase change material for temperature regulation. Comfort Layer – The comfort layer is made up of the brand’s Helix Dynamic Foam, a latex-like alternative that’s super soft and has a quick response to pressure, which should allow you to move around and change positions with ease. Since it’s similar to latex, it also comes imbued with natural cooling properties. Transition Layer – Directly below the Dynamic Foam, you’ll find a thin section of poly foam. Slightly firmer than the material above it, this layer is meant to gradually transition the sleeper into the pocketed coil system in the base. 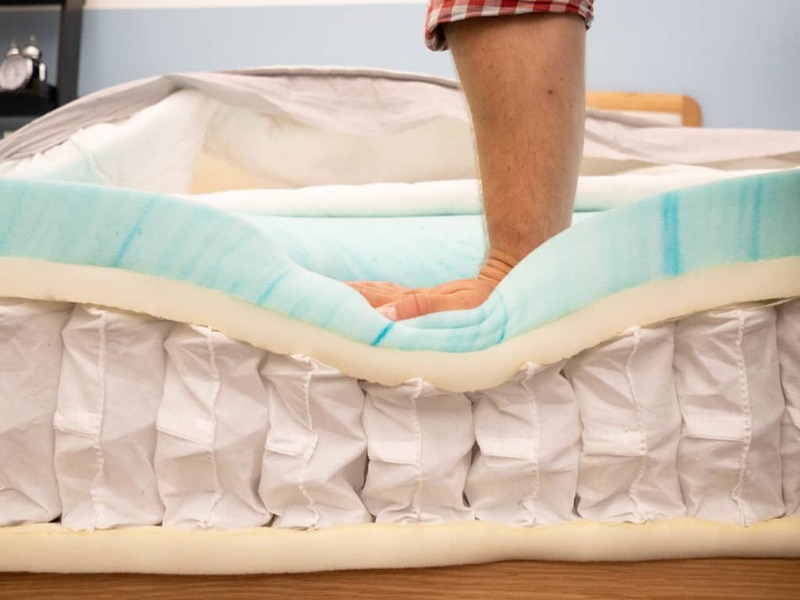 Support Layer – The bulk of the mattress is made up of this section of individually wrapped coils. This system brings a supportive lift to the structure, working to position the sleeper on top of the bed. Since the coils are individually wrapped, they’re also going to encourage extra breathability as air flows through the spaces in the coils. 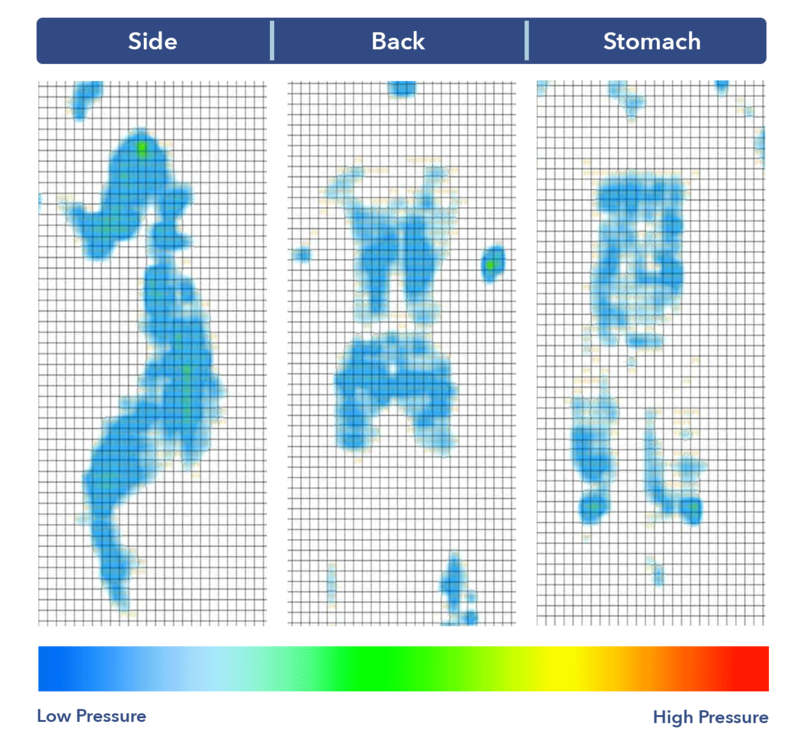 Base Layer – Last but not least, you’ll find a thin section of high-density poly foam. This layer doesn’t affect the feel of the bed too much, functioning mostly to give the pocketed coils something off of which to react. While the Midnight also features a hybrid construction of foam and pocketed coils, its design has been engineered to produce a medium firm feel. It’s one of two new Helix beds categorized this way, alongside the Dusk. Comfort Layer – Up top, you’ll encounter a thick layer of memory foam. This material has a slow response to pressure, which means you’re likely to experience some satisfying body contouring. While it might seem odd for a supposedly medium firm bed to feature a memory foam comfort layer, it’s important to remember that the presence of deep sinkage doesn’t always translate to softness; in fact, oftentimes it produces quite a firm feel. Transition Layer – After sinking through the memory foam comfort layer, you’ll find a transition layer of poly foam. While it’s the same material used in the Moonlight’s transition layer, this one is a bit firmer, which works to curb the sinkage of the memory foam and establish a supportive, medium firm feel as you hit the pocketed coils below. Support Layer – The pocketed coil system here is the same one used in the Moonlight, crafted to bring some supportive lift to the structure while also imbuing the mattress with some fantastic breathability. Base Layer – And again, the construction ends with a thin layer of high-density poly foam. Though the differences in construction between these two Helix beds might at first seem minor (truly, the only noticeable change is in the comfort layer), they actually do manifest in two totally unique mattresses. To be honest, I was kind of surprised by the comfort layers used in each bed. One might assume that a plush bed like the Moonlight would use memory foam and that a firm bed like the Midnight would employ a bouncy latex-like foam up top, but here, it’s the opposite. However, after lying down on each mattress, I found that the materials really did produce the feels the brand was after in ways I wasn’t expecting. The Dynamic Foam in the Moonlight is bouncy, yes, but also super soft and allows for some immediate sinkage. And while the memory foam in the Midnight does feature some deep body contouring, it’s quickly mitigated by the firm poly foam below it. I’ve yet to assess the other beds in the new collection, but what I see here indicates to me that the six models represent a steady gradient from Plush to Firm, which should allow most customers to find a bed that works for them. Each mattress in the Helix line has a different color ring to show which model it is. 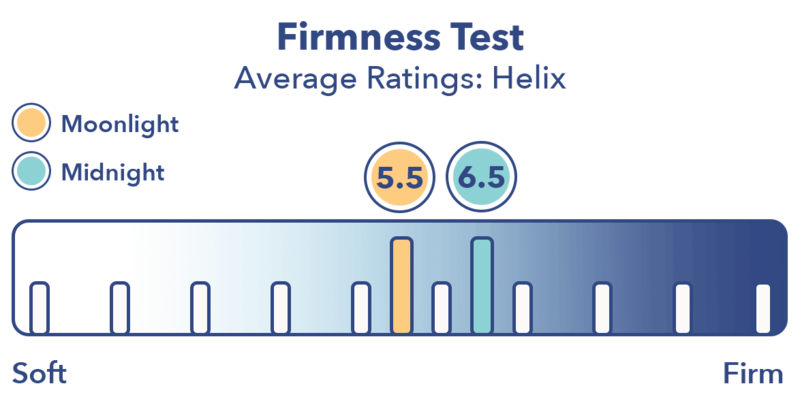 After taking a look at the construction of the Helix beds, let’s chat about their different firmness levels and feels. As I pressed into the Moonlight, I was struck by how soft the top layer of Dynamic Foam is. I sank through this layer with ease, but never felt stuck thanks to the material’s quick response to pressure. Pushing into the Midnight, I found that I was mainly interacting with the thick layer of memory foam in the comfort layer. This material has a slow response to pressure, so I could feel it contouring around my hand. There was a bit of variance among my testers for the Moonlight, but we landed on an average firmness rating of 5.6. When compared to the industry standard of 6.5 for medium firmness, it’s clear that this bed is quite soft. I personally gave the mattress a 5.5 as I found its soft foam top layers to produce a gentle feel. While the bounce of the latex-like Dynamic Foam coupled with the lift of the pocketed coils is designed to keep you positioned on top of the structure, you’re still likely to experience quite a bit of sinkage with this bed. This should provide you with pressure relief across your body and could be especially beneficial for side or combo sleepers. My testers and I were pretty much in agreement about the firmness of the Midnight, giving it an average rating of 6.75, which marks it as just a touch firmer than medium firm. In line with this, I gave the bed a 6.5. Though the memory foam comfort layer is soft and produces some quality body contouring, the other materials in the bed work to counteract this and create an overall firmer structure. In spite of this feel, I think it could make a great option for side sleepers, who will likely enjoy the cushiony support of the memory foam top layer. Keep in mind that if neither of these feels sounds quite right, you can always check out the four other beds in the new collection: the Sunset (Plush, softer than the Moonlight), Dusk (Medium feel, slightly firmer than the Midnight), Twilight (Firm, designed for side sleepers), or Dawn (the firmest mattress in the line). Back – As I sank into the Moonlight, I could feel the top layers of foam filling in the space at my lumbar region for some satisfying pressure relief. In spite of all this sinkage, I never felt stuck in the bed, and found it easy to change positions. Edge Support – Scooting as close to the side of the mattress as I could, I began to detect some compression through the soft foam top layers. While this would normally make me feel insecure at the edge, the pocketed coils actually did a solid job of lifting me up and keeping me secure in this position. Side – I continued to feel some nice comfort as I rolled onto my side. Side sleepers tend to favor softer beds that provide cushiony support to the shoulders and hips, so I wasn’t too surprised by the pleasant pressure relief I experienced in this position. Stomach – Turning onto my stomach, I could feel my hips sinking out of alignment with my shoulders, which caused a bit of tension along my spine. This is typical for plush beds like this, which is why stomach sleepers tend to go for firmer mattresses. That being said, those of you who doze primarily on your stomachs might be better served by one of the firmer models in the new Helix line. Back – Lying on my back, I definitely felt as though the Midnight was firmer than the Moonlight, which was kind of odd as I could also feel myself sinking deeply into the memory foam comfort layer. While the body contouring I experienced brought me some pressure relief in this position, it did make it difficult to move around. Edge Support – As in the Moonlight, I thought the pocketed coil system here did a fantastic job of supporting my weight at the edge. Side – Memory foam is usually a good material for side sleepers as it contours gently to the shoulders and hips, so I experienced a great deal of comfort in this position. Along with the Moonlight, I’d say the Midnight could be a solid pick for anyone who sleeps primarily on their side. Stomach – Though the Midnight’s firmer than the Moonlight, it still wasn’t quite firm enough to satisfy me on my stomach as the memory foam caused my spine to fall out of alignment. I’d suggest strict stomach sleepers check out either the Twilight or Dawn, two of the brand’s firmest beds. 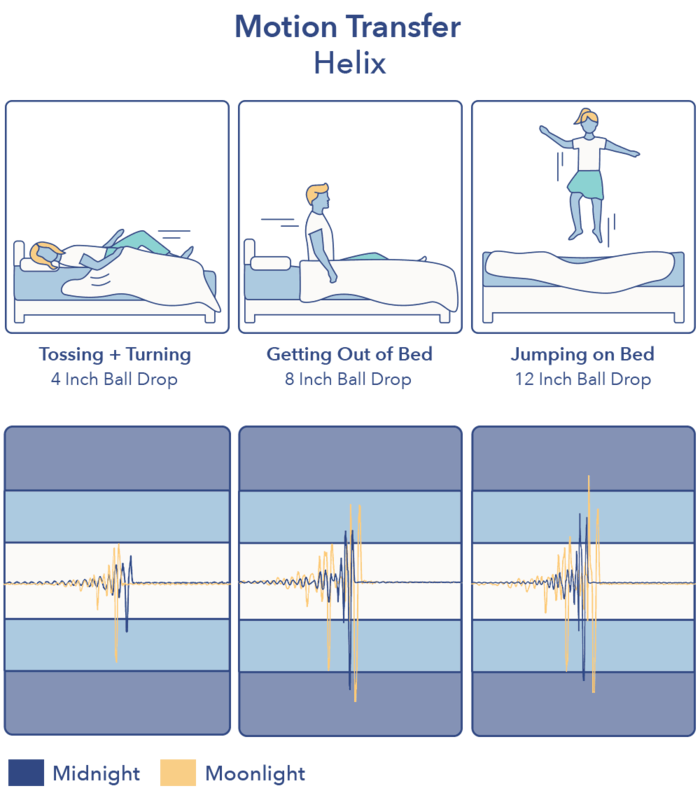 ARE THE HELIX MATTRESSES RIGHT FOR YOU? 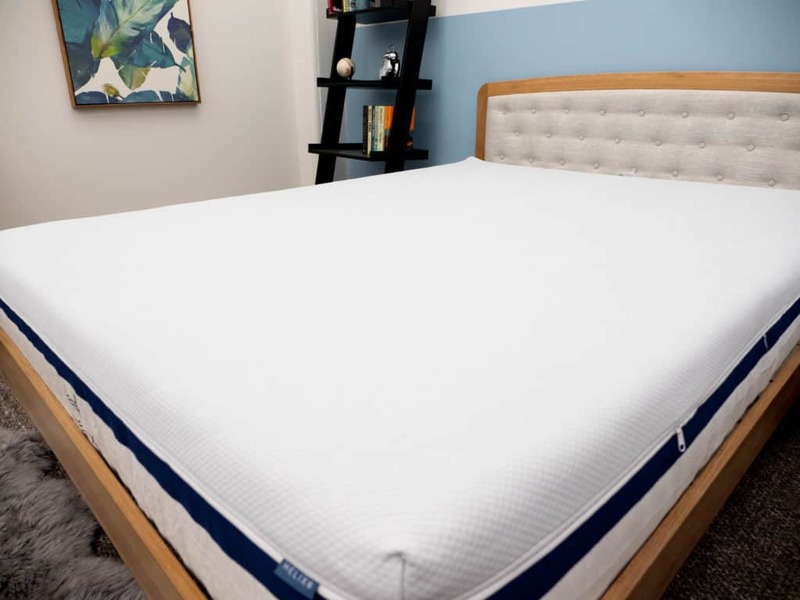 A standout feature of both mattresses is their great pressure relief, found in the Moonlight’s soft foam top layers and the Midnight’s memory foam. I’d also say a big plus for Helix in general is that the brand has so many different options available, allowing customers to really hone in on what they need. The Moonlight in particular features some fantastic mobility, thanks to the buoyant lift it gets from the Dynamic Foam and pocketed coil layers. For the Midnight, I’d say you get a nice balance between pressure relief and support, which should satisfy a wide range of sleepers. Now that we’ve gone over the nitty gritty details of the Moonlight and Midnight, let’s take a minute to compare them to some of the other mattresses I’ve reviewed. While beds are always going to feature characteristics that set them apart from one another, I think it can be helpful to contextualize these unique specs against one another. Another big name in the online mattress world, Purple beds feature a top layer of hyper-elastic polymer over sections of firm poly foam. The result is a bed with excellent temperature regulation and pressure relief. Below, I’ll highlight some of its biggest similarities to Helix. Range of Products – Since their respective foundings, both Helix and Purple have gone on to launch a wide array of bedding products. While the former has the new line of beds that I’m examining today, Purple also recently launched a new suite of mattresses: the Purple 2, 3, and 4, which come in various firmness levels. 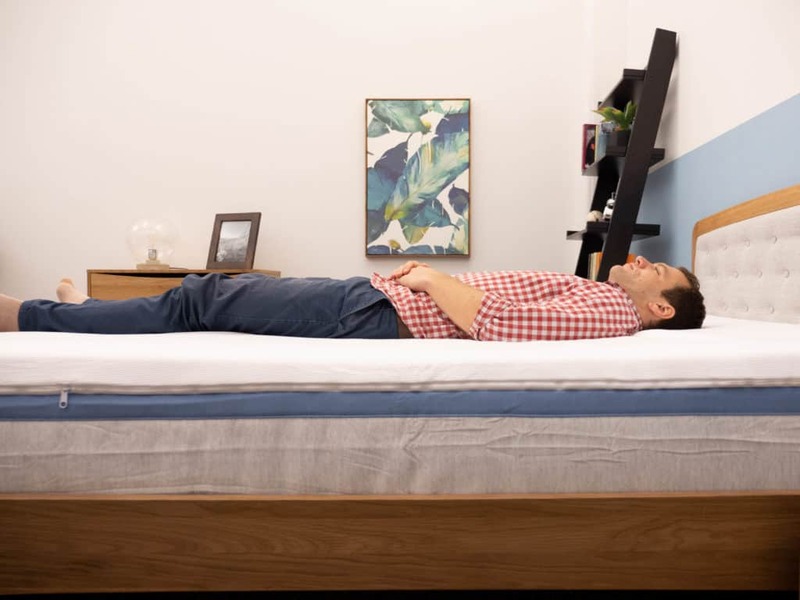 Pressure Relief and Support – I’d also say these mattresses are both great at offering the sleeper a healthy balance between pressure relief and support. The Helix achieves this with soft foam layers overlaying its firm pocketed coil system while the Purple benefits from all-encompassing feel of its hyper-elastic polymer layer. Helix and Casper were both founded in 2014 and have since gone on to become two of the most well-known brands in the space. While their approaches have always been different, they actually share a few key similarities. 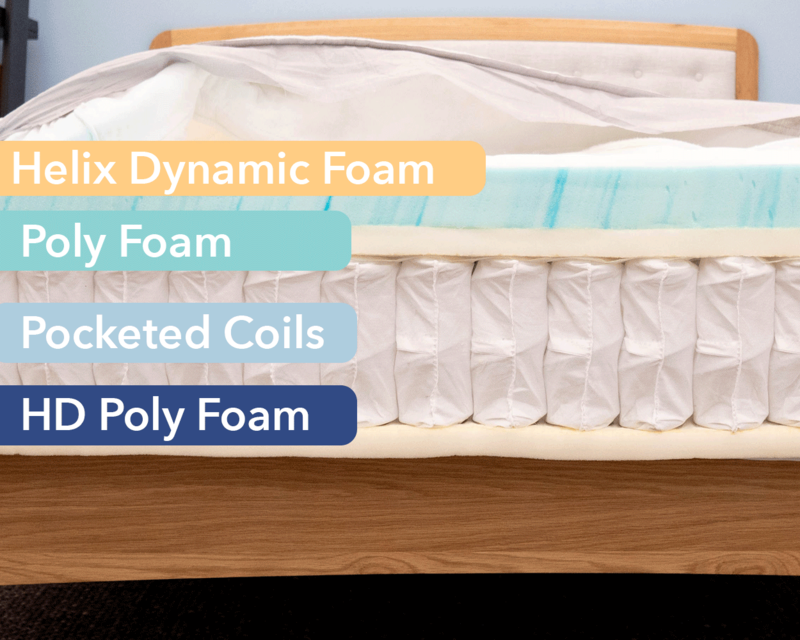 Balanced Feel – Whether in the hybrid design of a Helix or in the balanced foam construction of a Casper, both brands use a lot of different materials in their beds to satisfying effects. 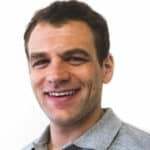 Breathability – I’d also say these companies really know how to make a breathable mattress. In the Helix, we see this in the combination of a thin cover with a tall pocketed coil system; in the Casper, the cooling comes from the latex-like proprietary foam in the comfort layer. 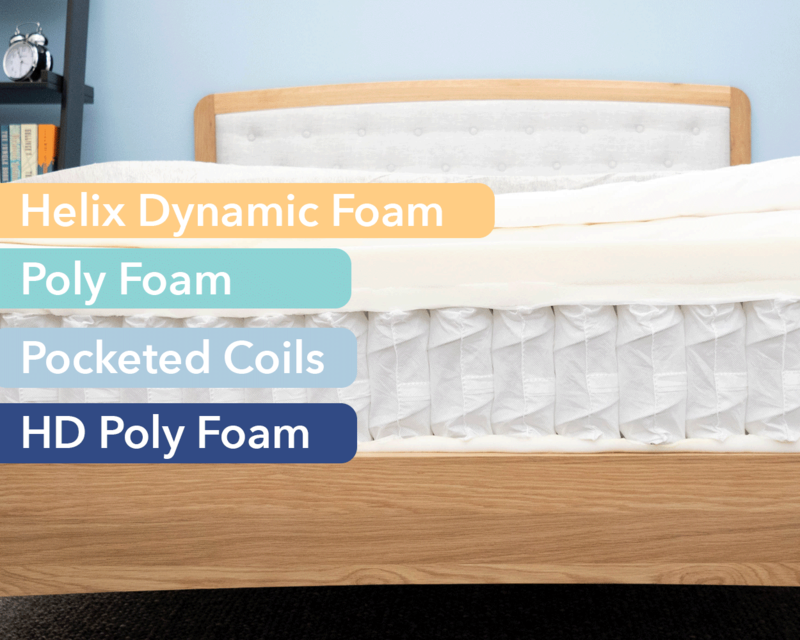 And finally, let’s compare the New Helix line to Nectar, a mattress that derives its gentle, pressure-relieving vibe from a thick memory foam comfort layer. Side Sleepers – As we discussed above, the Moonlight and Midnight are both great beds for side sleepers, as is the Nectar. All three models benefit from soft foam layers up top, which allow the sleeper to sink in for immediate pressure relief. 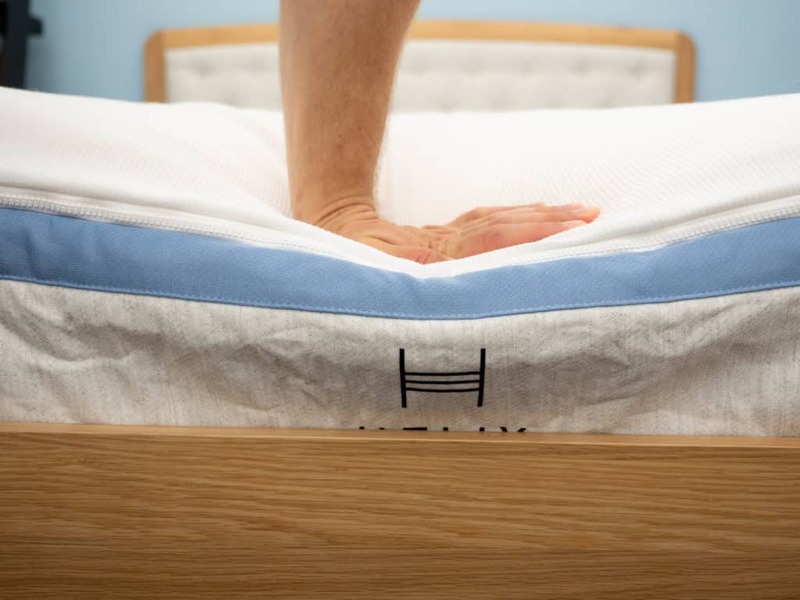 Cooling – These mattresses also sleep cool, thanks to the tencel cover and gel-infused memory foam in the Nectar and the individually wrapped pocketed coils and cooling foams present in the Helix beds. The Moonlight has quite high motion transfer results, which tell me you’re likely to feel your partner’s movements in the night. Given the bouncy nature of the mattress, I’m not too surprised by these results, but it is something for couples to be aware of. On the other hand, the Midnight exhibited much lower motion transfer results thanks to its thick layer of memory foam up top. 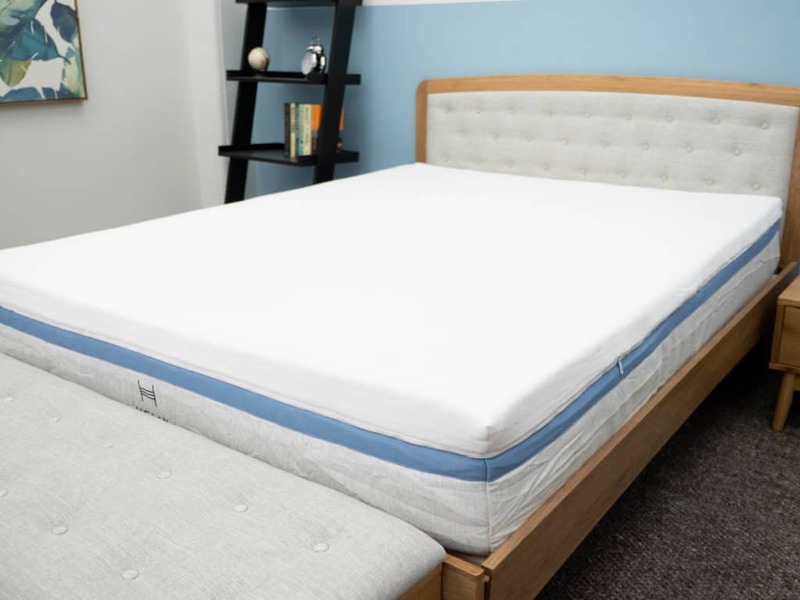 This material is excellent at absorbing and containing motion, so helps to curb the bounce from the pocketed coils to ensure that you won’t be too disturbed by your bed mate’s tossing and turning. As you can see, the two Helix beds’ sinkage rates begin to diverge at the 50 lb. marker, with the Moonlight showing above average sinkage for a bed of this construction and the Midnight coming in just a bit below average. 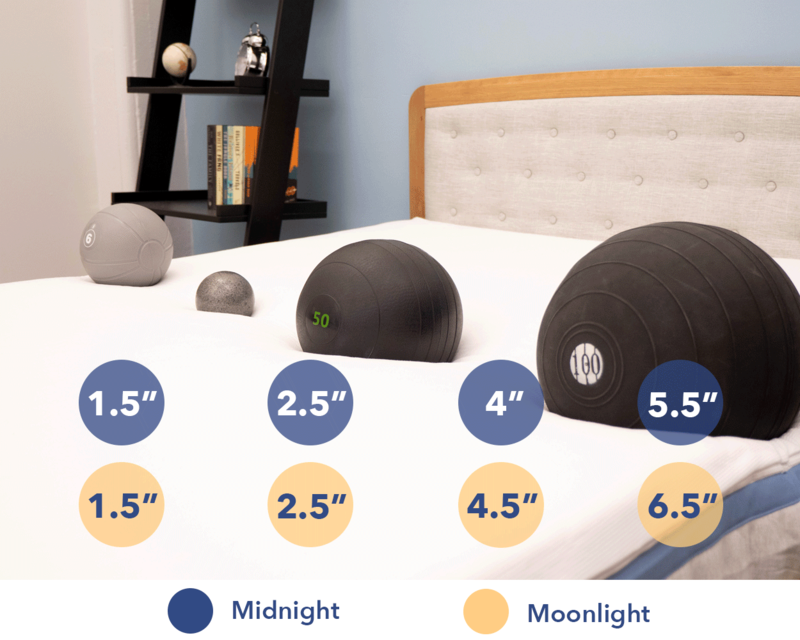 I would note that these results are a bit deceptive; as we discussed earlier, you’re actually likely to feel more stuck in the Midnight than the Moonlight, thanks to the former’s thick memory foam comfort layer. Note: Financing is available on all Helix models. If you’re convinced a Helix is the right mattress for you, the size and pricing information for the mattress are below. 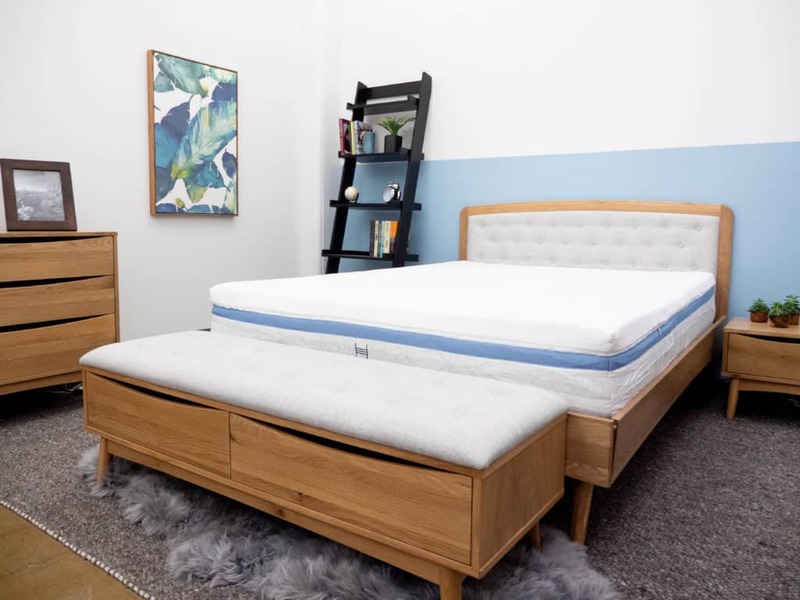 Please note that these prices reflect standard pricing, but use the code SLEEPOPOLIS125 to save $125 on your purchase of a mattress with one other item! 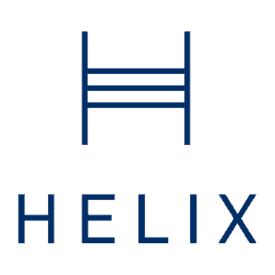 For more information about the other mattresses in the Helix line click here to head to their website!